"I’m hoping to get what’s in stock in warehouses now." Families are scrambling to lock in big purchases now before new Trump tariffs kick in fully and hike prices higher. 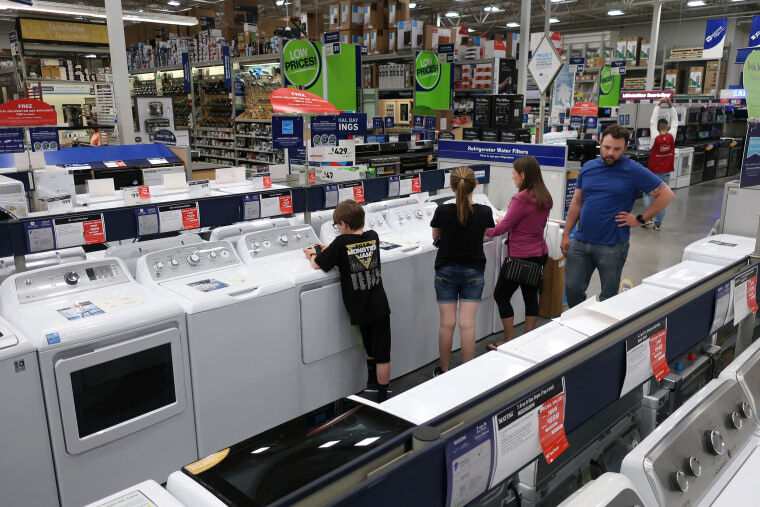 “It is definitely pushing us to make a purchase even though our washer hasn’t completed died,” said Collin Webster, a software account executive from Irving, California. His 12-year-old washer made by LG, a South Korean company, has taken a beating from having three sons. "I’m hoping to get what’s in stock in warehouses now," he said. Washing machines imports were already hit with a 20 percent tariff, causing prices to rise by 16 percent, according to the Consumer Price Index. Later this year the tariff will rise to 50 percent, once a 1.2 million quota is surpassed. That should happen in the next few months; the U.S. imports 3.4 million washers annually. They're not the only item on the shopping list under pressure. Televisions are also part of a threatened batch of tariffs that haven't yet gone into effect, causing consumers to wonder whether to try to buy now and beat the tariff, or wait for Black Friday deals. But by then the tariff may have wiped out any savings they hoped to get, raising prices several hundred dollars, according to the National Retail Federation. Although Americans are still relatively optimistic about the economy, cracks are beginning to show, and economists say a crisis of confidence could derail the consumer spending that has propelled the recovery to a near-record length. The University of Michigan’s preliminary consumer survey for July, released Friday, showed month-to-month declines in both consumer sentiment and current economic conditions. In June, the percentage of consumers concerned about negative impacts from the tariffs jumped to 38 percent, up from 15 percent in May, according to the survey. “At this point any impact would be more psychological than anything,” said Greg McBride, chief financial analyst at Bankrate.com. “The effect of tariffs on consumer prices is still a few months away, but that’s where a good deal of the threat lies. Any higher prices or a faster pace of inflation due to tariffs will erode the buying power consumers have,” he said. According to the National Retail Federation, the average household gets a boost of $18,000 in purchasing power thanks to free trade agreements. A trade war could chip away at that figure, compounding the inflationary pressures created by a tight labor market. Dwight Johnston, chief economist for the California Credit Union League, said that consumer confidence and willingness to spend is disproportionately affected by the stock market. “If the stock market was in the tank, consumers would probably be losing confidence,” he said. “They kind of use that as their gauge,” he said, even though only about half of American households are invested in the market. Webster, the father, is worried about the scope or the duration of the trade war mushrooming. “I’m hoping saner minds prevail sooner rather than later,” he said. “The talk about the automobile tariffs is terrifying."